Source: S&P Dow Jones Indices, as compiled by Bloomberg L.P. Note: S&P GSCI indices shown in the chart are spot return indices, which only reflect levels of futures contracts included in the index. After decreasing nearly 20% in the first half of 2017, the spot energy index in the Standard and Poor's (S&P) Goldman Sachs Commodity Index (GSCI) ended 2017 16% higher than the beginning of the year. Higher crude oil and petroleum product prices in the second half of 2017 were responsible for the increase in the S&P GSCI energy index. Source: CME Group and Intercontinental Exchange, as compiled by Bloomberg L.P. 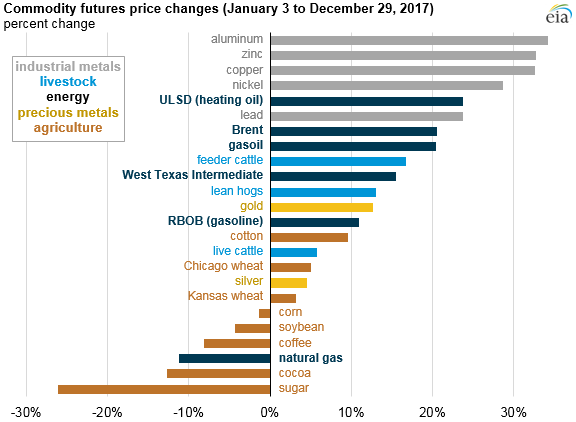 Note: Price changes reflect changes in front month futures contract price for each commodity. RBOB is reformulated gasoline blendstock for oxygenate blending, and ULSD is ultra-low sulfur diesel.